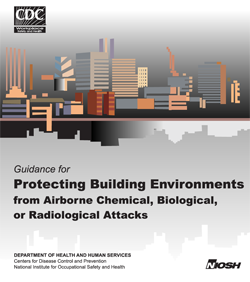 This document identifies actions that a building owner or manager can implement without undue delay to enhance occupant protection from an airborne chemical, biological, or radiological (CBR) attack. The intended audience includes building owners, managers, and maintenance personnel of public, private, and governmental buildings, including offices, laboratories, hospitals, retail facilities, schools, transportation terminals, and public venues (for example, sports arenas, malls, coliseums). This document is not intended to address single-family or low-occupancy residential housing (less than five family units). Higher risk facilities such as industrial facilities, military facilities, subway systems, and law enforcement facilities require special considerations that are beyond the scope of this guide.